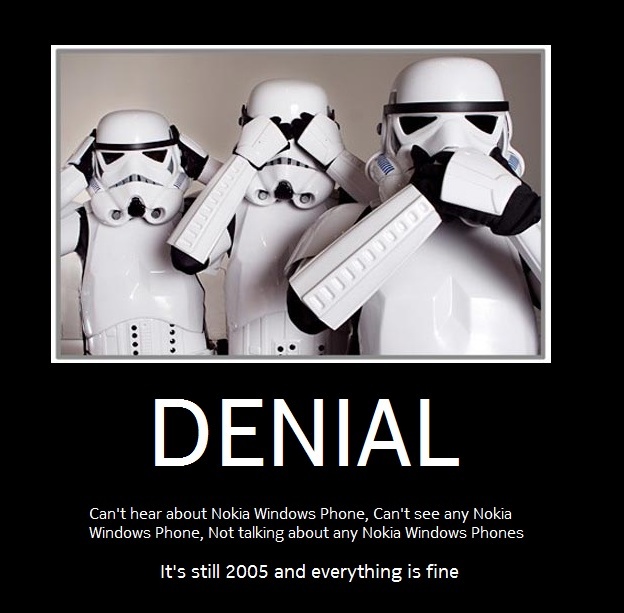 Elop Conspiracy Theories – Are Nokia Employees and the rest just in complete denial? Business Insider (also posted for Yahoo Finance) an article saying that some long term Nokia staff are still in denial about Nokia going with Windows Phone. They talk about the theory of some employees (and even some fans) that Elop is a mole, a saboteur planted to kill Nokia for within and prepare it as a meal to be eaten up Microsoft. This is in response to an article by global post, where workers are apparently leaving at 4PM already since the February 11 announcement. Folks are apparently still doing contracted hours but not doing any extra due to missing positive spirit. Matt accepts going with Windows Phone might still not pay off, but staying the course would probably have been the worst decision. Board hiring an outsider (not Anssi) to change things up. Creating an ecosystem would have taken too long with MeeGo (and what on earth is next now it’s Tizen? What will be the next Linux OS that Tizen will blend with?). MS has deep pockets and plenty of developer support. We’ve discussed this over and over again in various articles and various comments where the topic of Elop presents itself. With Nokia World in a week, the start of the new strategy will begin to bear fruit. Transition to Maemo then MeeGo was good on paper. S^3 may have seen temporarily as positive. Android was growing too quickly, getting more and more users, cheaper and cheaper phones, more and more powerful hardware. What of Symbian? The name is connected to slow, non touch friendly frustrated experience (thanks to S^1), the hardware can’t keep up (though many will say it doesn’t need to). Lower price point Androids that offered a more fluid experience began eating Nokia share. More powerful handsets pushed users away that wanted really high end. iPhone is too big of a name. Nokia let Apple slide over them, producing one magnificent mediocre phone after another whilst not amply defending their good name. This started way before Elop. Microsoft won’t let Windows Phone fail. Microsoft are preparing a massive Windows 8 update that harmonises with Windows Phone. Nokia is at the heart of all of this change. Another angle in all of this: It wasn’t necessary to announce (or accept) limitations of Symbian and publicly tar its name. It may not have been necessary to announce the death of Symbian. It was badly communicated. Perhaps like BlackBerry, just quietly move your platforms around. Do both Symbian and Windows Phone simultaneously. Keep both going and kill one when the other is strong enough. Unless Elop was also there to cut down on that 5Billion euro R&D expenses. Too little return for so much investment? If all was well at Nokia and all was going to plan, there would be no need to drop OPK or pick the outsider, Elop (and go with Anssi who has said he would have stayed the course). Some add other theories that well, the board and shareholders have more incentive to support Microsoft and not Nokia. Oh well.